Back at the end of 1987 and into 1988, Epcot Center hosted a very interesting show in the center of Future World. It was called the "Daredevil Circus Spectacular" and it featured death defying acts, elephants, and even a live orchestra. It was not something that guests were neccesarily expecting to see while visiting this park, but it was entertaining nonetheless. 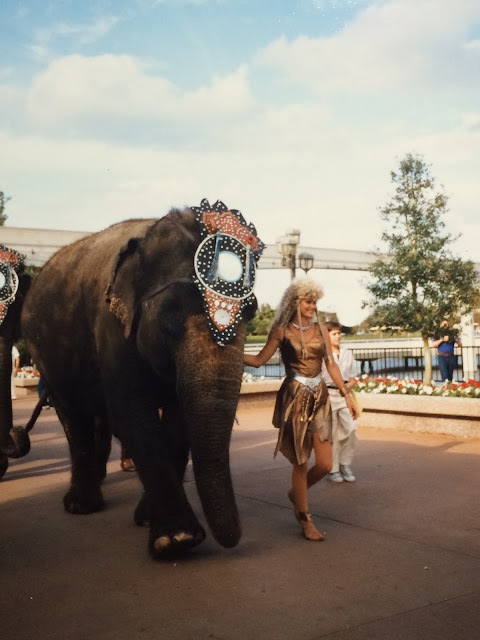 This picture, from 1988, shows an elephant approaching the main stage, which was set up on the Fountain of Nations. A handful of these giant animals would walk out from backstage between the UK and Canada pavilions, and parade through part of the World Showcase on their way to the show. 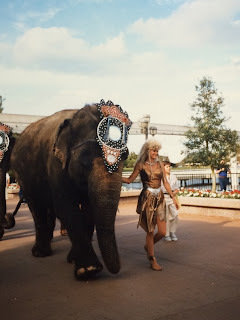 Can you imagine seeing elephants walk by you as you were strolling through Epcot? It was quite a sight!